Best Apple Pie Ever, if I do say so myself . . .
i don’t know what the weather is like where you live. . . but where I live it’s COOOOOLD! 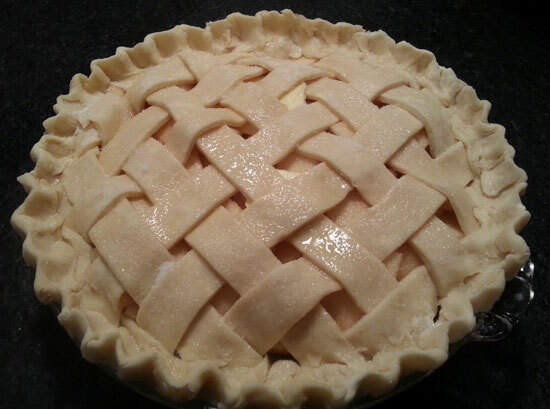 And when the weather gets cold, I make apple pie. 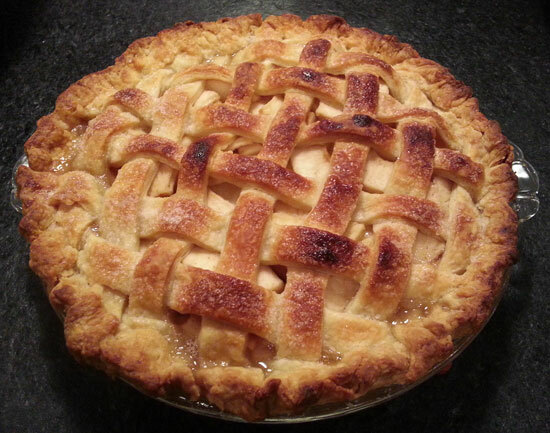 The pie above is a picture of the Christmas apple pie I made with my Dad in Maine. It was . . . delicious! You see, old fashioned apple pie has a rather legendary status in my family. And I have been perfecting my version for a long time now. In the last few years I’ve hit upon a pie everyone who tastes it loves, every-single-time. I confess that I got my secret ingredient from a recipe in Cooks Illustrated. I won’t include their recipe here as I’m a great lover and ardent respecter of copyright law. But their basic recipe is pretty much the same as every basic crust recipe I’ve ever made. 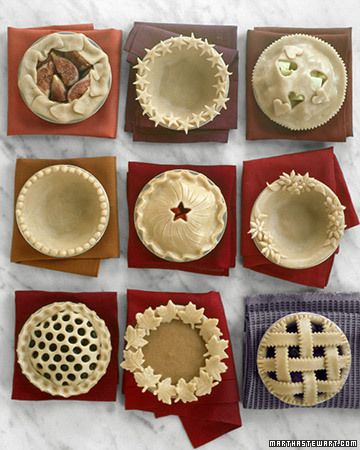 So, follow your favorite pie crust recipe to the letter and make it a double so you can make both the bottom crust and either a lattice or full top. I personally prefer an all butter crust, so I don’t mess around with lard or oil: only 100% sweet cream butter for me. Once you’ve got the butter cut until the flower and butter mixture resembles course corn meal, you can add the cold cold water like you always do and then, here’s the secret, add the same amount of vodka. It does not activate the gluten in the flour so you get the most amazing flake, almost like puff pastry. 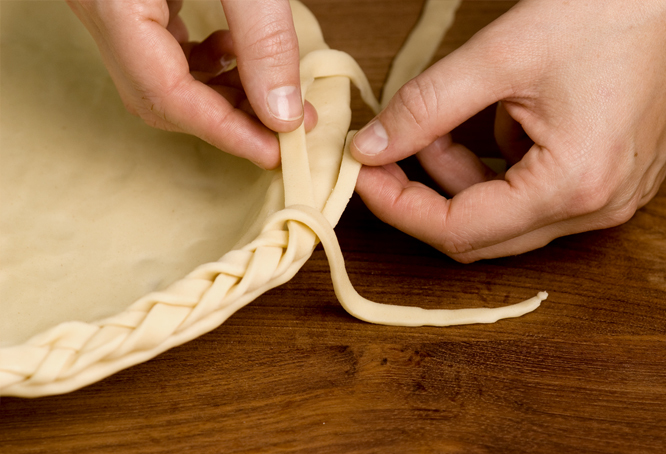 The extra liquid makes the dough more workable without over-activating the mechanism that holds the crust together. Too much water and crust is too tough, too little and the crust will shatter. I put half the dough in one piece of plastic wrap and the other half in a second piece of plastic wrap. I shape the dough quickly into a rough ball and then flatten to a thick disc almost a personal pan pizza dough shape. Wrap tightly in the plastic wrap and put in the freezer to store for a while, or, at the very least, put in the fridge for a couple of hours before rolling out. Put a metal cookie sheet in the oven with a big piece of parchment paper on it. I put the cookie sheet in at the start of the pre-heating process so the sheet will be really hot when the pie pan goes on it. The function here is to get the crust cooking from the bottom up so that the crust is beautifully crisp even on the bottom. While the oven is heating up, start preparing the filling. I like sweet crispy apples. My favorites: Honey Crisp. Pink Ladies are in close second. I get out my pie pan. Fill the pie pan with Honey Crisp or Pink Ladies apples in a single layer for big apples and add just one extra apple if you want a really big pie. This plan works no matter how big or small the pie pan is. Peel and core. I use a peeler that also cores and slices the apple. I cut each slice into thirds. If you don’t have such a gadget, peel by hand, cut the entire apple into thirds or quarters (and core at the same time) and then cut each section into pieces that are about a quarter of an inch thick or slightly thinner. 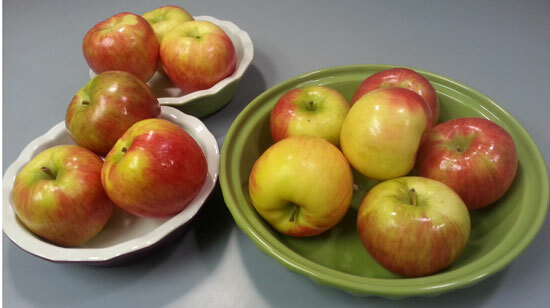 Next, I put a little citric acid over my cut apples to keep them looking pretty and fresh. A little lemon juice or Fruit Fresh does the trick. And now the fun starts. Here’s my basic philosophy: If it tastes good in the bowl, it will taste good in the pie. Go for fabulous but a little less sweet than you want the finished product to be. Never fails. What to Add to the Apples? Sugar. I use a cup measure and start with about a cup and a half rough. Then I sweeten to taste (but not yet). Spices. A shake or two of Cinnamon, a pinch of dried Ginger, Clove. A scrape of Nutmeg. 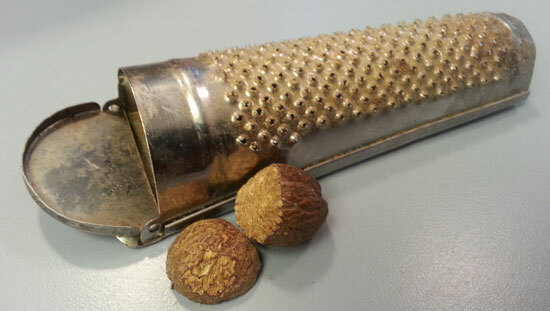 I use a fresh Nutmeg with a tiny little scrapper. A generous splash of good, real Vanilla. Spirits. And now, drum roll please, add a shot or two of excellent Bourbon. 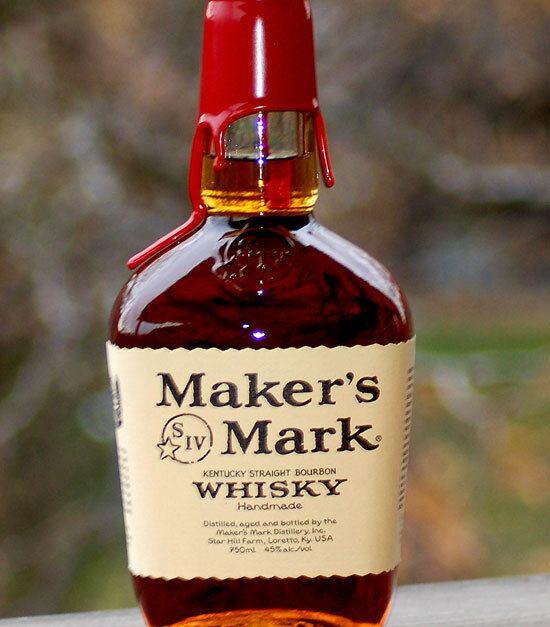 I have been known to use delicious brandy or even just good ole Maker’s Mark Whiskey (welll, like the very last time I made pie). 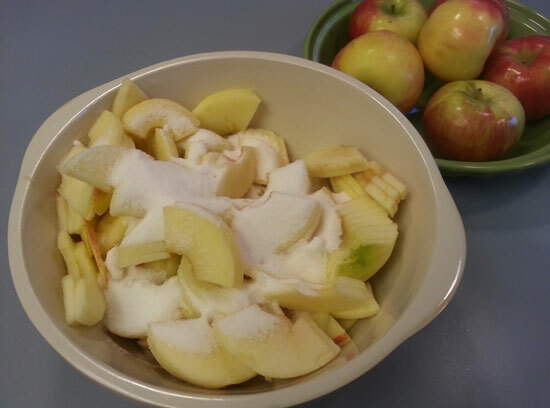 Mix until the sugar starts to pull the juice from the apples. Now taste and taste often! Not sweet enough? Add a bit more sugar a bit at a time until it is almost, but not quite, sweet enough . . . That means it’s perfect. Dust with a bit of flour or corn starch to thicken the juice during cooking. Maybe 3 or so tablespoons, roughly. Taste again. If you are smiling, and love it, it’s going to be amazing. 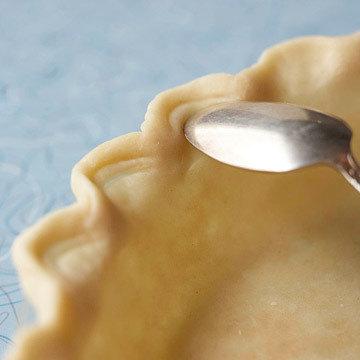 Stir thoroughly and set aside with the big spoon just sitting there loving where it is because you’ll mix it one more time before pouring into the pie shell (don’t forget). If frozen, the dough will need to rest on the counter for a while until it is workable. If in the fridge, it might still need a few minutes on the counter. I have hit upon the method of starting the rolling out process by rolling around the edge first–this works well to keep the edges from splitting too much. 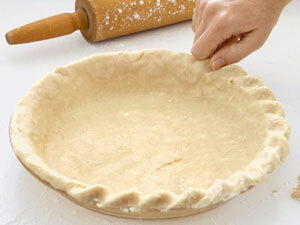 If a full top crust, cut some slits to let the steam escape. I prefer a lattice top most of the time, so I score with the top side of a regular kitchen knife and then put together while it is on top of the pie. I then sprinkle the top with water and then drizzle granulated sugar all over the top – don’t go wild, of course. Just enough to make it glisten and add a bit more sweetness to the top crust. 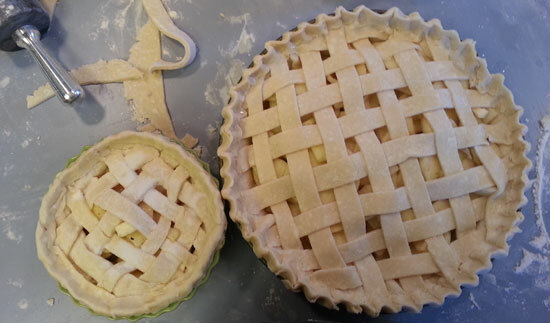 I am teaching my son to make pie (he is 7 right now) and he has not yet developed his own crimp, but definitely his own “look.” The little pie here is one he made all by himself! And it was delicious! Start in the oven at 425 degrees for 20 minutes or more depending on the size of the pie and the amount of apples: bigger pie full of apples, better make it 30 minutes. After that, turn the temperature down to 325 and bake the rest of the way. If the crust starts getting too brown, just put a piece of aluminum foil on top or just where it is getting too dark (sometimes on the outer crust/crimp) – this will protect the crust while it finishes cooking. 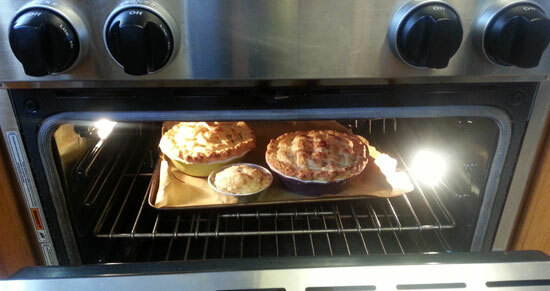 The pie is done when a nice golden brown and the juices are thick, a bit darker, and at a slow bubble. This means the juice has boiled and activated that thickener you put in. 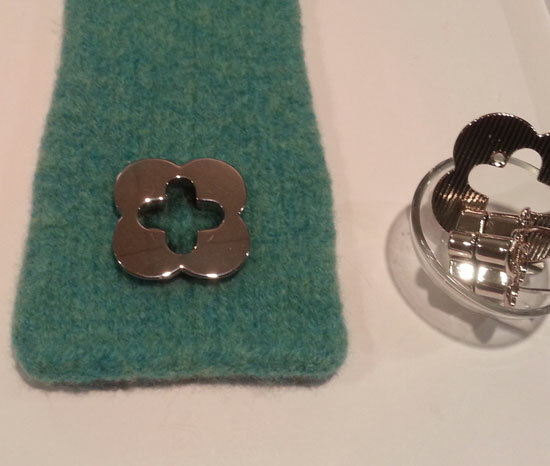 I have had a number of inquiries as to the best way to put a turnlock in a felted bag. In fact, in a workshop last year some of the participants chided me for not having done a video or blog tutorial on this subject. I took the pictures below at that workshop as we were working through the steps. 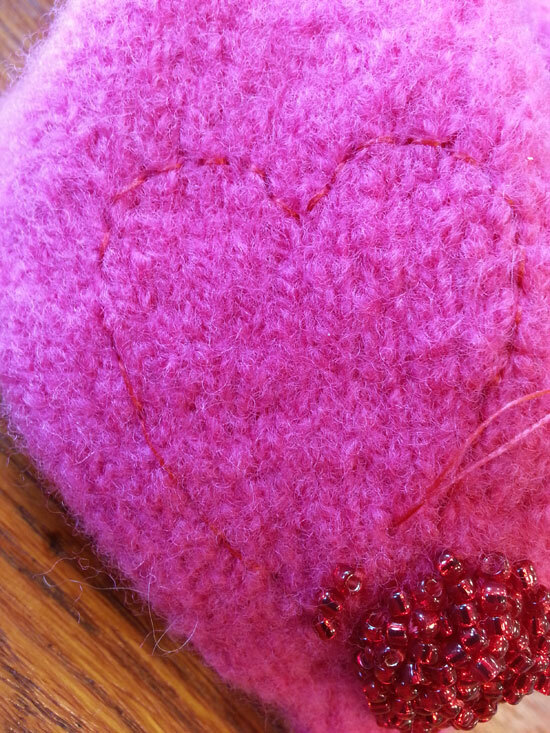 So, thank you to the participants in the bag finishing workshops at Ann Marie’s shop Yarn Diva. What follows is a step by step explanation of the method I taught in that bag finishing workshop, and the same method use in the bags I make myself. First, gather your materials: The turnlock flap can either be the flap of a bag – the Dinner Party Backstage, for example, could sport a turnlock instead of a fancy magnetic snap – or a narrow flap made specifically for the turnlock – this is the case here. You will also need newspaper to protect your work surface, a damp paper towel for clean-up, a bottle of fabric glue or Locktight Superglue, specifically the Extra Time Control formula (sorry, not pictured! ), a pen to mark the turnlock flap, a small screw driver, scissors. and, of course, the turnlock itself. 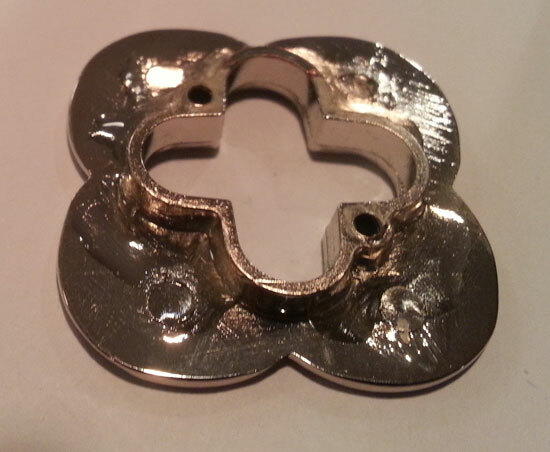 First, you should place the turnlock in the center of the turnlock flap. You may want to measure with a tape measure to make sure it is where you want it. I recommend using a black pen or Sharpie to mark the location of the turnlock on the front or back of the turnlock flap. While we show it on the front of the flap here, it may be better to mark up the back just in case you need to revise the placement. 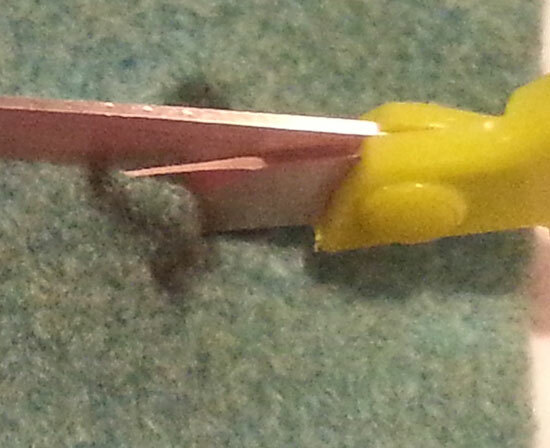 Now you will need to cut the felt, so be very careful and deliberate. The image will you have drawn on the back of the turnlock flap will be just slightly smaller than the actual hole needs to be. Cut to that marked size and then slowly shave a milimeter at a time until the lock housing fits through the cut out without any buckling or tightness. The turnlock will be held in place best if it is glued in place. 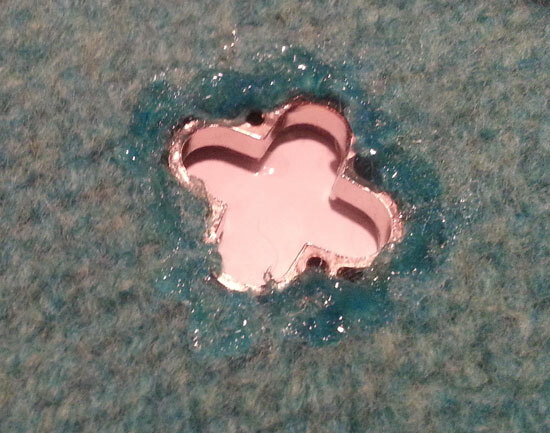 First, apply your fabric glue or Superglue to the “front” of the turnlock housing as shown below. About this much glue. Be thorough but conservative. It is not necessary to take the glue all the way to the edge of the turnlock face because then it may show on the felt – not a good look. Put the front (right) side of the turnlock flap down on the wrong side of the turnlock face. Press in place with your fingers for a good stick. 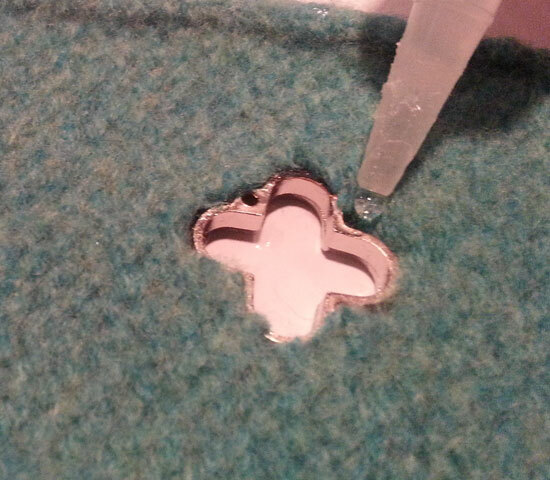 In order for the flap to be thoroughly held in place in the turnlock housing, apply glue to the cut edge of the felt once the front side is face down on the turnlock front housing. About this much glue. Again, too much and it will be a difficult mess. 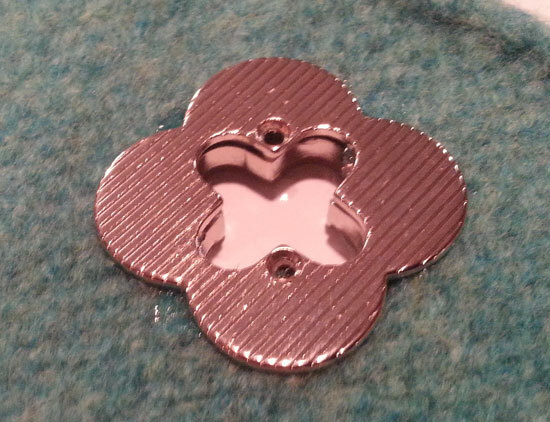 Step 7: Put the back of the turnlock housing wrong side down on the newly glued surface and press in place. Line up the holes for the screws with the screw housing. Use your little screw driver to tighten the screws. Step 8: Clean-up turnlock with damp paper towel. 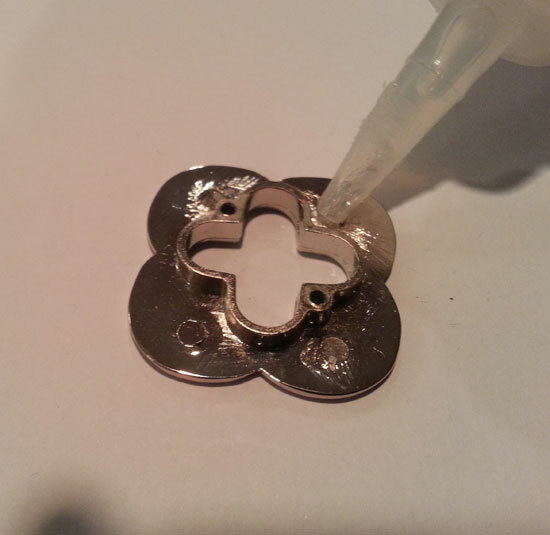 Use the damp paper towel you have at the ready to clean-up any glue that got squeezed out and then polish the exposed metal front and back of the lock until shiny and free of glue. Step 9: Lock the lock and Press Prongs Through Bag. Before you put the turnlock flap on the bag itself, lock the lock and then position the flap on the bag. Only at this point do I actually baste the flap itself in place on the bag. Once the flap is basted in place and the flap itself allows to fall to its resting place on the front of the bag (with all parts of the turnlock on the flap–that is, the lock, too), press the prongs of the turnlock “lock” into the bag (so that the prongs are now on the inside of the bag) where you want the lock to sit. Next, unlock the lock and, holding just the lock itself, press the lock prongs the rest of the way through the bag front. 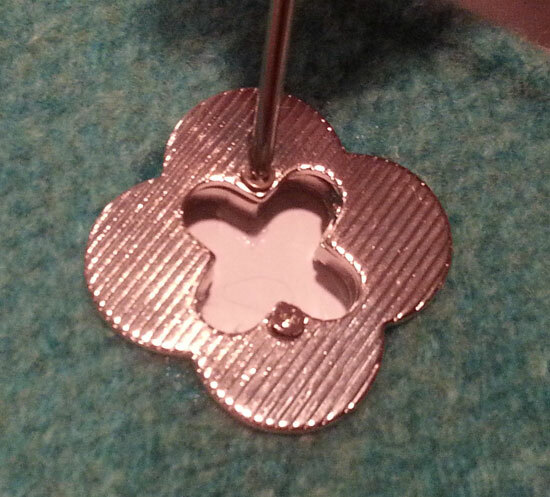 Put the little metal sleeve on the prongs and press the prongs toward the center to secure. 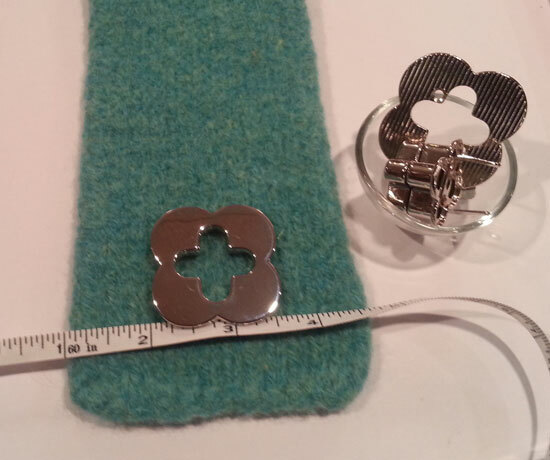 With the lock still unlocked, now you can rivet or sew the turnlock flap in place permanently. This part of the process is finished! Still have questions? Ask them in the comments section below and I will answer either in the comments or another blog posting. Hearts on My Sleeve: Seasonal Favorite Now in Crochet! 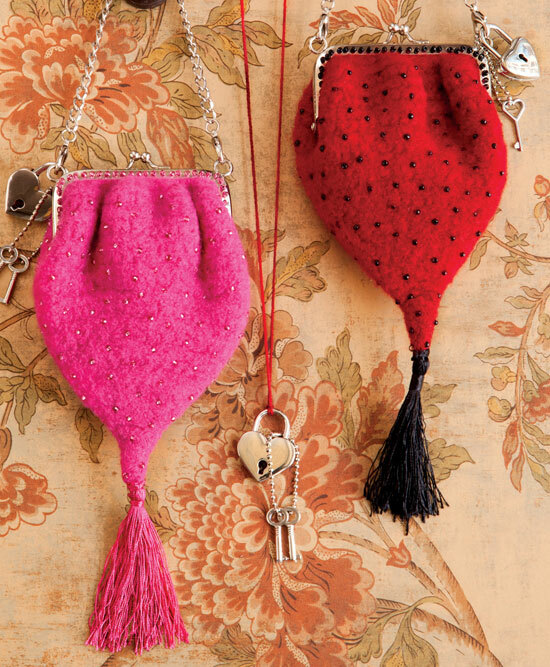 For the crochet version of this design, I teamed up with Janet Brani to translate the knitted bag into crochet. 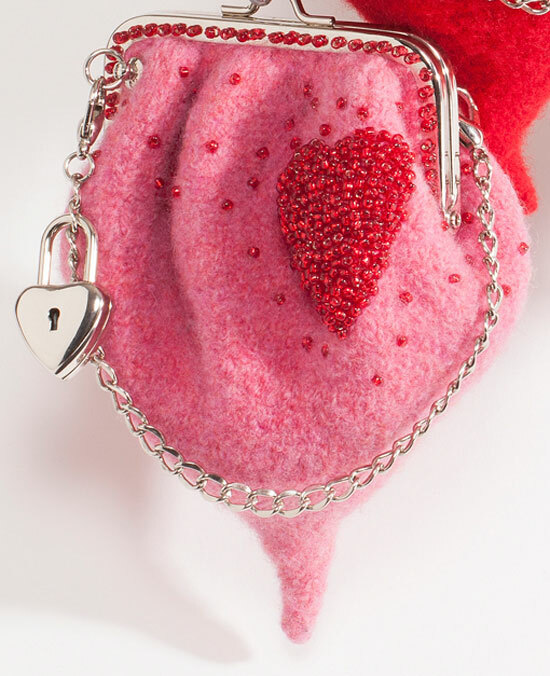 I love the resulting tiny purse, perfect for Valentines Day, for any fancy party, or (picture this) in white or in an ensemble of brights for a Bride and Bridesmaids. 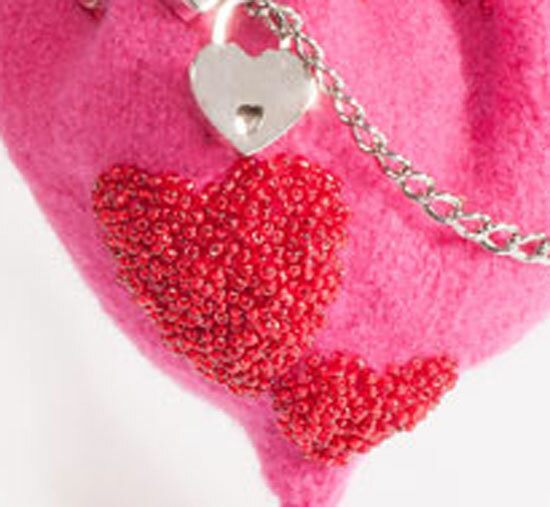 In next week’s Noni Q&A, I will be exploring how to do the hand-beading and make beautiful beaded hearts or other images (almost like applique) on felt, but get your bag started now and you’ll be ready to follow along with my step-by-step tutorial in next Friday’s blog. 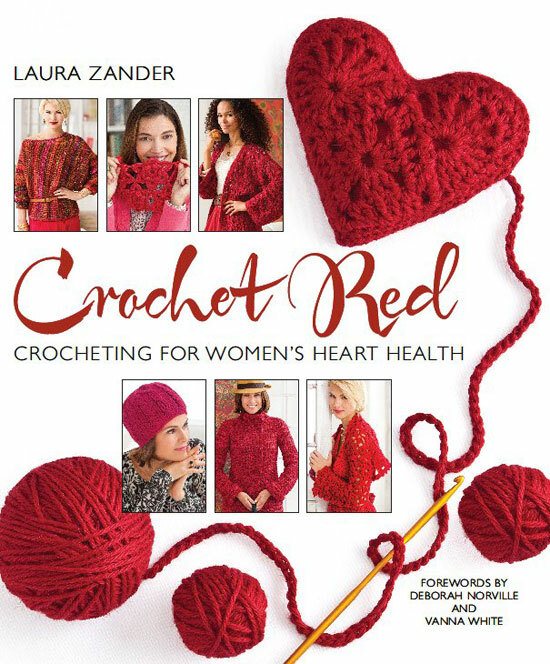 You can purchase Crochet Red for the crochet bag or buy the pdf for the knit version of the pattern by clicking here. Call me at the studio or write to me to order your hardware kit and yarn. Here, I used the Hearts on My Sleeve instructions as written, but I also made cherry blossoms and the cherry blossom leaves from Noni Flowers. 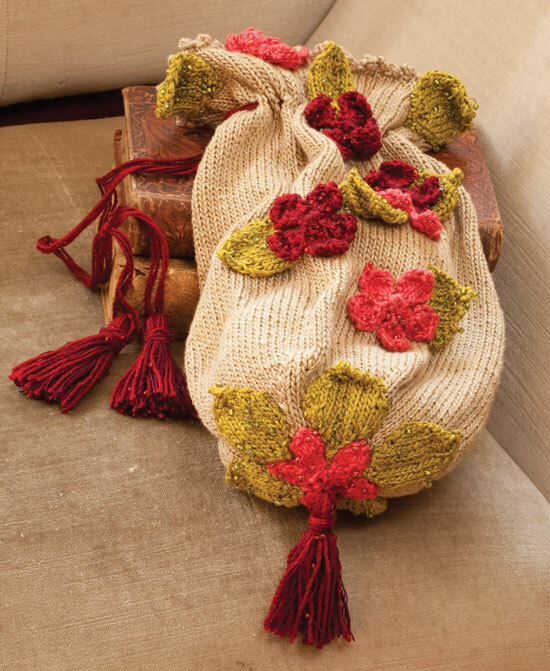 Specifically, I used the flower instructions on page 43 and leaf instructions found on page 152 with the information about the project Cherry Blossom Pauper’s Purse. 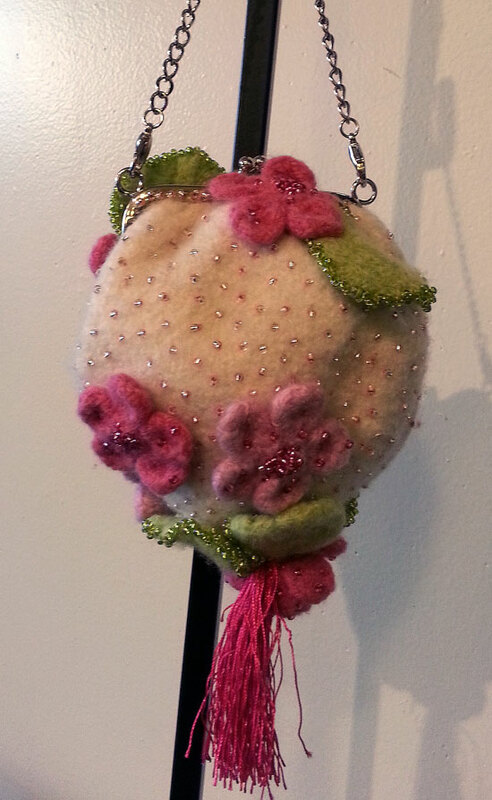 As you can see, the Pauper’s Purse was not a felted bag but worked in Tilli Tomas Plie and Beaded Plie. 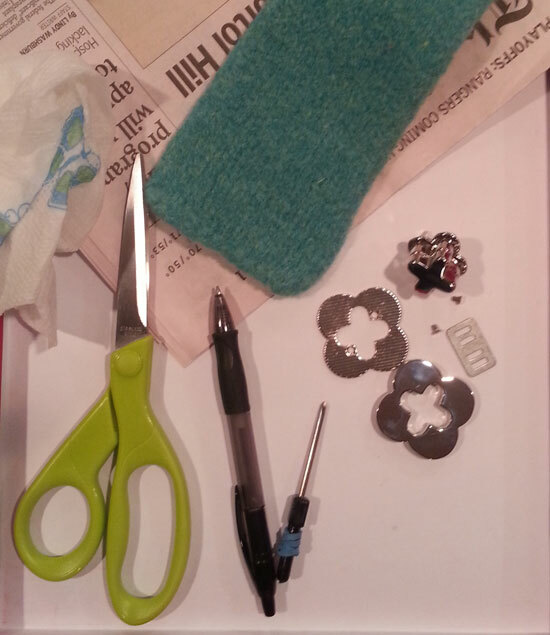 Nevertheless, the instructions for the knitted leaves and flowers need no adjustment for the wool/felted versions. After the blossoms and leaves are felted and beaded, the results are delicate and romantic in true-to-life shades. They would be dramatic and daring if the flowers were red and the leaves black. Subdued if worked all in shades of grey and white and black. 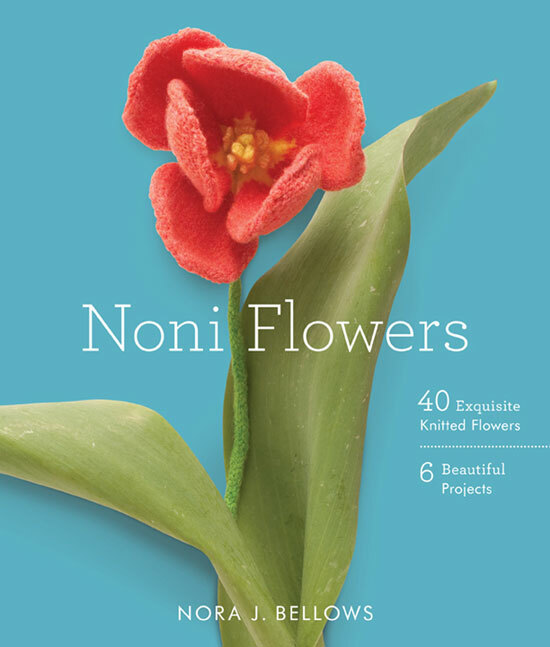 Check back on Jan 31 for more in the Noni Q&A and share your own versions of this bag on the Noni Designs Facebook page and/or ideas here in the comments. Saying Yes: Acceptance, Limitations, Creativity, and the Power of What If. . . ? Every year in mid-October I travel to the fair grounds nestled in the heart of Rhinebeck, New York for the New York State Sheep and Wool Festival. Noni has a big booth there. There are women who come every year to purchase a project. The next year they come back with the finished bag on their shoulder or wearing a beautiful coat and buy the next next project. I love this. Watching those beautiful bags and coats come back, I feel some measure of pride in being a small part of that project, that growth. This year (meaning, actually, this past Rhinebeck of 2013), a pair of women I remember from the previous year walked into the booth together and found me. They live, I think, in the City and are dear friends. They had both purchased kits for the Ridge Bag. They had done the knitting together, felted together in the same washer, the in same load even, as I think they told me. I will name these woman Clotilde and Veronique. 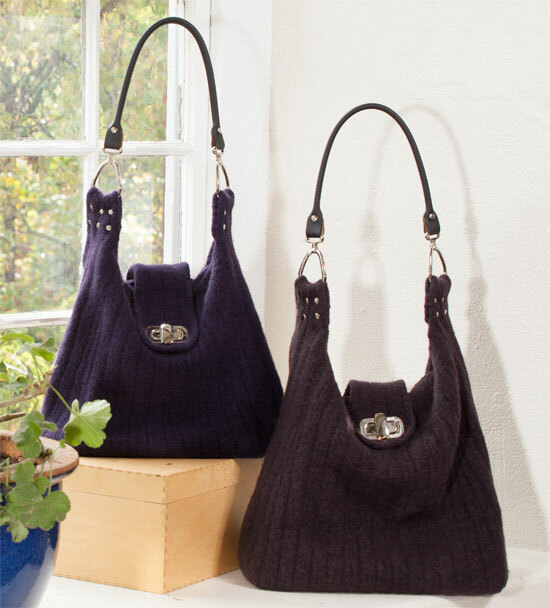 Clotilde’s bag was nearly done —it had lovely crisp shaping at the bottom, shiny nickel bag feet, the zipper sewn in, the handles in place with 6 evenly- spaced rivets. All that was left to be done was the turnlock, about which Clotilde asked advice (and about which I am currently working on a Noni Q&A blog, so stay tuned and check back on Friday). The bag looked, to my eye, maybe better than the original I made myself which hung, at that very moment, on a wreath hook above us. Veronique’s bag was not finished and had been bunched up in a tote, brought to show me its imperfections. At first, I thought the subtle creases were simply due to being folded while still damp into that same tote. And, truly, this may be partly the case. Even in its rumpled state, the bag was lovely to me, and not with the rose-colored glass eyes of someone who sees only perfection where it does not lie. I saw all of its faults but also what it would, or could, become. I’ve seen a lot of lovely and not so lovely bags. This one was pretty darn terrific. One of the things I like about the Ridge is how the rib pattern, when felted, gives the bag defined vertical stripes. Veronique held the bag toward me for me to see. I took it all in, and, without a bit of dissembling said, “It looks great!” I was thinking of the work she would do, how she would thoroughly soak the bag in a sink full of hot water, how she would press out the water so that it was simply damp and pliable, how she would cut the stiffener for the bottom and sew it in, tacking directly into the overly-felted places, if there were any, and also into any less-felted place so as to even the surface and make it almost impossible to see such inconsistencies and also almost impossible to feel them. She would put in the six bag feet, matching up the prongs of the bag feet with both the holes she had punched on the stiffener inside as well as the lines of purled stitches now striping the bottom. She would lay down the second layer of stiffener carefully covered with a bright fabric surprise or a subtle grey lining to match the bag itself. 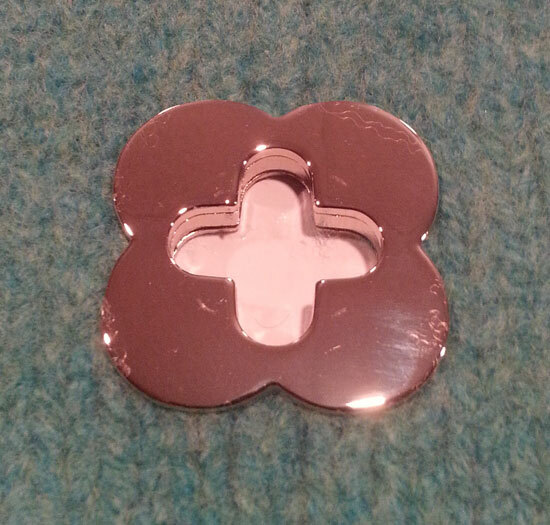 She would rivet on the handle, sew in the black zipper, stitch the metal label on the back. She would rivet on the turnlock flap with the six or eight shiny nickel rivets to match the six or eight rivets holding each handle ring. With every step, the bag would look better and better due to the dampness and her work, the attention of her fingers pressing the fabric smoother and smoother. But Veronique has not finished as many bags as I have, I think, and she has not seen the imperfections that have come out of the washing machine in my kitchen, imperfections I have had no luxury to nurse: Photo shoot in two days, no time to knit and felt again. Had to go with this bag, as it was, had to fix it. Had to say yes. “No, look at it,” I think she said, and held it out to me again, insistent. She pointed to all the places she felt were problems. She compared her bag to Clotilde’s. Hers was not as good. “Why did this happen?,” she wanted to know, despair and disbelief in her voice. “We wanted to show you our beautiful bags. We had it all planned.” I could see the image of what was supposed to have happened in contrast to the little triangle we now formed. Her question was so big and there are so many possible answers. 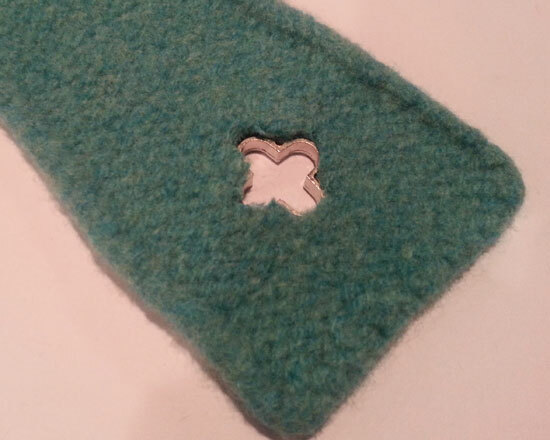 Maybe there was an inconsistency in the knitted stitches that etched themselves into the felting. But maybe not. Maybe the bag got creased up in the washer and couldn’t undo itself. Maybe the lingerie bag was too small or too large and tied itself in a knot, maybe the color of Veronique’s bag made it felt differently than Clotilde’s bag. But knowing why something happens doesn’t fix it and these answers seemed only to make Veronique feel worse. I had no magic. I only had solutions that involved working with what was. I told her that the imperfections she was seeing in the depth and the texture of the purled stripes mattered more to her than to me. I should have thought to get down the Ridge bag I made myself, the one that hung not 2 feet above our heads, and scour it for such disparities. I am sure we would have found it. But in many ways, this is not the point . . . and it would not have consoled her. Felt is not perfect. And if it appears to be, it is fooling you. Even leather is not perfect, decorated as it almost always is with notices about it being a natural product and therefore full of inconsistencies. A leather bag wears the imperfections that the creature who before bore that skin sustained during its life: the surface bears evidence of a cow’s movements next to a barbed wire fence, the calluses of sleep and use, a wound, the bite of a horse fly, the habits of the body in the world. So, too, the felt in a bag bears witness to our own moods sometimes: one day my knitting might be tighter than the next, it has lain forgotten in a bag for months, nay a year. The very fiber itself is made from the fleeces of many animals, and some of those fleeces are incredible, soft and strong and supple, while others are not. There is great diversity in a single strand of yarn. And the felt bears witness to all that has brought it into being; the grain a Merino sheep eats, the tenderness with which it is raised, the age of the animal, the weather it endures, the soil under its feet, the skill of the shearer, the the twist in the milling, the way the steam sets the twist, the hands of the knitter, the swish of the washer, the heat of the wash, the alkalinity of water, the particular tumble it receives, the attention it is paid during all of that, the violence of the spin that dries it to dampness. Even my bags come out of the washer looking like lumps. Sometimes I pull them into a shape and smoothness that seems impossible given all the variables. And sometimes they come out with problems I did not expect and I must find a way to fix, or at least disguise. Veronique wanted me to tell her what to do, how to fix it. And I tried. I tell you, I could see it myself and it was beautiful. But if Veronique could see what I saw, her own picture of her hopeless bag pushed the one I had just painted away. She protested that working too much over a bag, like a piece or jewelry, just makes it a “hot mess.” That’s a term I despise for its ugliness, but she’s right, of course: sometimes, in our efforts to fix something, we end up piling things on top to the point that it is overdone, overly freighted with good intentions and desperation. That is, I agree, not usually beautiful. But careful, restrained, thoughtful attention, a good plan, and some hard work are different. Veronique was so unhappy, so disgusted. I could feel it and it felt terrible and I have been her before but I have also been her and gotten myself out of that rut of thinking. All that money in the yarn. All that time. Photo shoot tomorrow. No choice. Say Yes. Make it work. Get to work. But I didn’t have a day or two days. I had minutes. And I am afraid, in the end, it may not have been enough. I asked her to stop saying such ugly things about her bag. I held her shoulders in my hands and looked into her eyes and asked her to stop, breath deep, feel my heart. 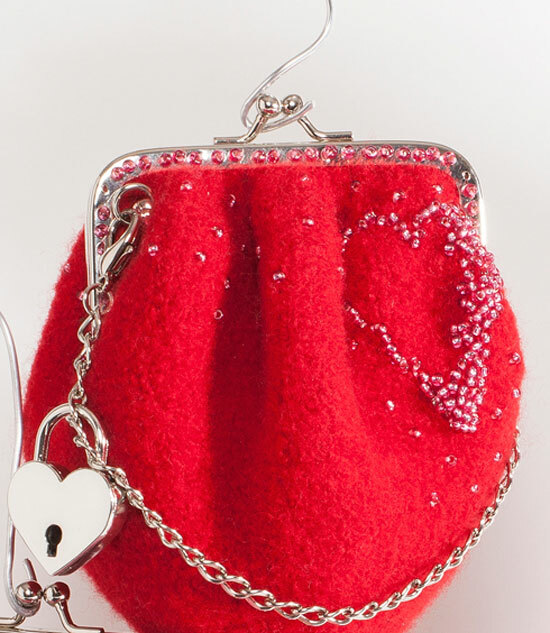 Open her heart to what I felt in my heart about her bag, with all the problems she saw there. “Feel my heart,” I said again. And I think she did. She tried to reset her thinking. Maybe she closed her eyes, took a breath, stopped the ugly talk for a moment. She said quietly, “Ok, I see what you are saying.” She squared her shoulders, I think. She turned toward the bags on display and gestured to one, said she liked the quilted look of the cabochon rivets on the front of my Dinner Party Backstage bag. She could start with the front and then order more rivets later if she wanted to. 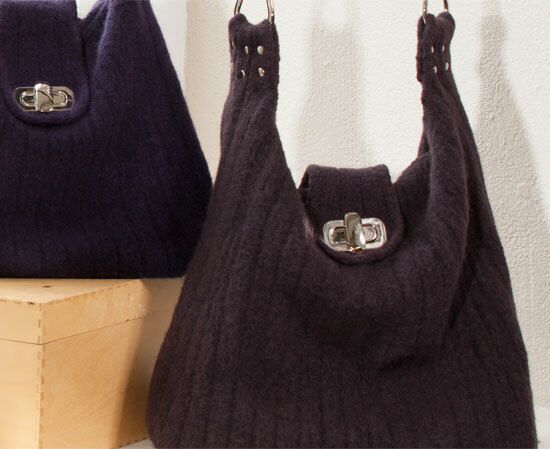 They would go well with the brightness of the turnlock as a focal at the center of the bag. I could see it. 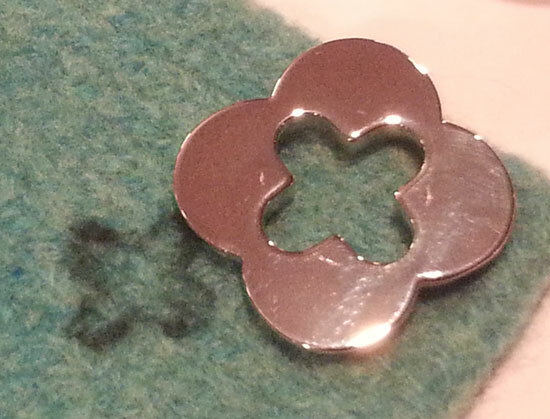 It would look smart and it would be a faster than knitting two Poppies, hand-beading. Very different finished bags, but both terrific. We picked out the rivets. I gave her a big hug. She looked like she felt better. I said, “Send me a picture.” She smiled and she and Clotilde left. Hours later, Clotilde came back without Veronique, the rivets and the receipt in her hand. “She is not convinced,” is what Clotilde said if I remember right. We refunded the money and put the rivets back on the wall. I felt sad all over again. I still feel sad, because I can still see that amazing bag Veronique could have made (may still!, I hold out hope), and I am convinced to my very core that it would have been better than the bag I originally designed and that hangs even now from the wreath stand in my studio. If Veronique came to the studio and spent the day with me, I still think she can do it . . . I mean, she knows how to do this. Her hands know. Her brain knows. And I know she can do it without me, too. I hope she might read this and be convinced, at least enough to say yes and get to work. Because, you see, it is at just this moment of despair, when things don’t turn out the way we wanted or predicted, that most challenges us and requires a creative approach. I agree with Phil Hansen, an artist who had to overcome the way nerve damage in his hands made it impossible for him (a pointillist in the beginning) to make a simple dot or draw a straight line anymore. His Ted talk called Embrace The Shake holds such stark truths and can inspire us all. But we can’t always move without help, without someone else asking a question or making just the smallest (and biggest) suggestion: What if you embrace the shake? What if you put a ruffle here? What if you tuck in the sides? What if you cover that up? What if dots become squiggles? What if. . . What. . . if . . . ? 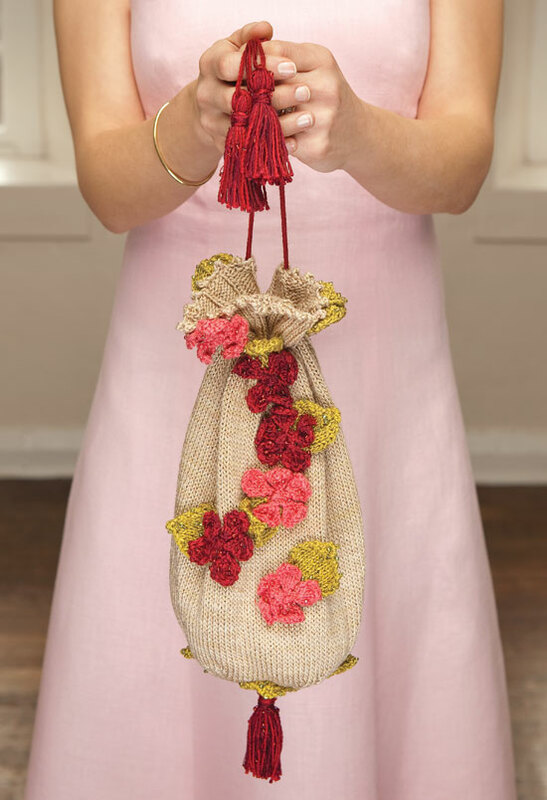 Someone from the class donated bright red Hydrangea flowers to her little sage-green bag. Clara found 4 shiny crimson bag feet and put them on the bottom. She tried the Amazing Magnetic snap, liked it, and covered up the ugly back on the outside with one of those sweet little red flowers. She lined the stiffener piece at the bottom with bright red fabric. She blocked the handle into a lovely arc across the top of the bag and tacked it there with invisible stitches. What she did was a collaboration of ideas that I and other members of the class offered and she generated herself, a beautiful synergy. That is what creativity is: it is work, hard work, in a community of other people engaged in a creative process. And creativity is, as Phil Hansen suggests, working with a limited scope of materials and exploring an idea within those limitations. It is saying yes to adversity and absence and restriction and making something out of it. Clara could have whispered, in the light of all of our suggestions, “No, it’s ruined.” Other students in other workshops have done so, turned away, left early. Instead, Clara said yes. And, I tell you, her bag was so pretty. We all loved it. I secretly wished it was my own bag and maybe everyone else did, too. And she, rightly, loved it most of all, saying, as she left, that she had it in mind to go shopping and get a new red dress to match. She was going to the opera soon, or a special wedding anniversary dinner—something wonderful, I remember—and she was going to carry her new bag and wear her new red dress. She was radiant and beautiful with her accomplishment. When we follow a pattern, it is not always easy, but there is, nevertheless, a certain amount of safety in doing so. So when the pattern fails us there is greater risk, but also opportunity. Phil Hansen found in himself a creativity that would not have been spurred into being had he not damaged his own body in the execution of that same art.